Florida hiking trails stretch the length of this beautiful chain of islands. No matter where you go on your hoking holidays in this tropical paradise, you'll find something special to discover on these relatively easy to maneuver paths. The primarily flat terrain, coupled with developed paths of varying degrees of sophistication, make it possible for just about anyone to explore the abundant nature the Florida Keys are famous for. You'll notice that in the Florida Keys, your age, or physical condition aren't as major a factor as it would be on hiking trails in other parts of the country or world. Amazon also features a variety of sources that share information on hiking options in the area. You can look through the previewed items or use the search box below them to delve deeper into areas that are of interest to you. You'll also need to make sure you have appropriate hiking gear with you. On your Florida Keys vacation plan a nature walk, and you'll find there will be ample opportunity to discover interesting birds and butterflies. 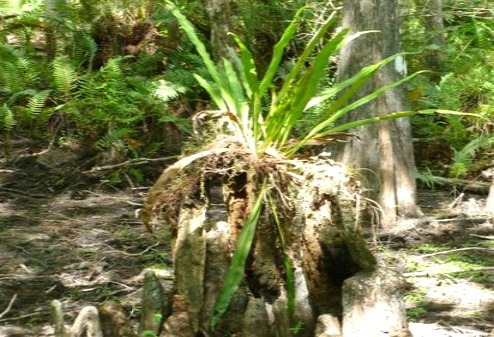 You'll likely encounter a host of Florida wildlife, and a vast assortment of interesting and unusual plants. However, there are a few key points you'll want to remember before venturing out on any of these Florida hiking trails. First you'll want to ensure you've applied mosquito repellant, or at least have some along. During the winter months the bugs aren't as bad, but they're still around. Since you're walking in a natural environment you'll likely encounter more bugs then elsewhere. Their presence can be just enough of a nuisance to make your hiking trip unpleasant. Other 'must haves' when out on Florida hiking trails include sun screen, hat, and good polarized sunglasses. You'll also want to ensure you're carrying a camera and have a pair of binoculars. If you're an avid outdoor enthusiast, you may also want to carry a field book identifying the various plants and wildlife you'll likely encounter on your trek. As an Amazon Associate I earn from qualifying purchases such as the following groups of items. You'll want to be mindful of where you walk, because on any of the Florida hiking trails it's easy to trip when you're looking up into the trees or sky. You'll also need to watch out for dangerous wildlife. 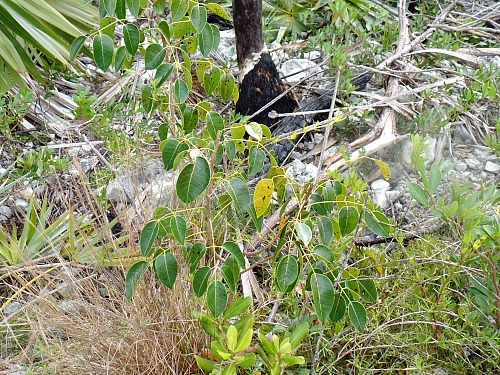 Snakes live in the hammock forests, and both crocodiles and alligators inhabit the Florida Keys. There's also the concern about poisonous plants. Some of the plants and trees you'll encounter can cause a mild to severe reaction if touched. If you see tree bark oozing, do not touch, as this is a poisonwood tree. Any time you interact with nature there's the potential of risk. However, you'll find that walking, hiking or jogging on Florida hiking trails will be about as safe as it gets. You'll also find that it's a lot of fun, and a great way to spend part of your Florida Keys vacation. It also doesn't matter where your Florida Keys travel adventures take you, there's going to be some place close by, where you can get out and stretch your legs, and enjoy a variety of terrific Florida Keys activities. Starting at the top of the chain of islands is the Key Largo area, where you have a number of Florida hiking trails to choose from. The primary hiking trail is the Florida Keys Overseas Heritage Trail which stretches from MM 106 in Key Largo down to Mile Marker 0 in Key West. This downloadable Florida Keys Overseas Heritage Trail map provides you with a good overview of the Trail and any offshoot paths. Primarily used as a biking trail, the more developed sections are also popular with hikers, joggers, and walkers. 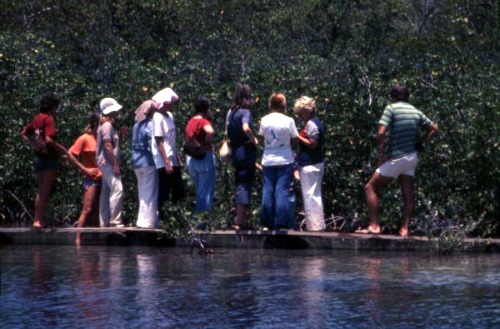 In the Key Largo area there's also the Dagny Johnson Key Largo Hammock Botanical State Park. Located not far from Crocodile Lake National Wildlife Refuge, the park entrance is at County Road 905, about a half mile north of MM 106 at the Overseas Highway intersection. The Florida hiking trails through this State Park provide a good look at one of the nation's largest tropical hardwood hammocks. You'll quickly discover that the area is home to an abundant variety of birds, plants, and Florida wildlife so you'll want to have your camera and binoculars handy. With about 2.5 miles of primarily paved hiking trails you'll have plenty of opportunity to view some of the areas more interesting flora and fauna specimens. Guided ranger tours are also available, and you can call 305-451-1202 for further detail on tours and general Park information. The longest of the two hike trails is the Mangrove Trail which is approximately a three-quarter mile wheelchair friendly path. There is also the beautiful Wild Tamarind Trail which is a brief quarter mile hike. For additional information on John Pennekamp or the trails you can contact the Park at 305-451-6300. South of Key Largo and north of Islamorada you can enjoy hiking and some rather productive birdwatching at Windley Key Fossil Reef Geological State Park. 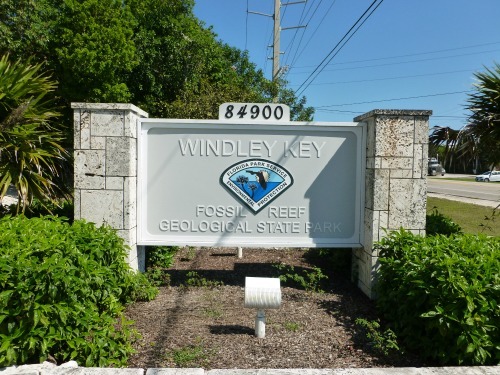 Windley Key Fossil Reef State Park is located at MM 84.9 on Highway 1, and is open from 8 am to 5 pm Thursdays through Mondays. For additional information about the Park and the local hiking trails, they can be reached at 305-664-2540. Windley Key Fossil Reef Geological State Park was originally used as a quarry by Henry Flagler for the development of his visionary Overseas Railroad. The interpretative trail not only teaches you about the history of the quarry, it also educates you about the different plants that constitute the hammock. You'll also learn about the amazing variety of fossilized coral you'll discover on your nature walk. If you're going to be staying in Key Largo for several days and are very interested in the Dagny Johnson Park area, you can apply for a backcountry permit at John Pennekamp State Park. This will give you access to an additional six miles of less developed hiking trails. These trails however are much rougher than what you traversed in the Park. In fact, some sections may be completely impassable if there's been any weather damage. The overall key to your safety on any of the Florida hiking trails is to stay on the paths. Bugs, wild animals and snakes call the bushes, marshes and forests around you home. Plus if you're not a particularly knowledgeable botanist, and are unable to correctly identify all the vegetation around you, you could have a nasty encounter with a poisonous plant. In Key Largo, there's also the John Pennekamp Coral Reef State Park, located at 102601 Overseas Highway. Here you can enjoy two short Florida hiking trails that are fun to go out on, especially if you're camping in Key Largo. Hiking and camping in Florida seem to go hand in hand. When you're in the Middle Keys, whether you're camping or just passing through, there's some wonderful trails to explore in the Marathon Florida area you won't want to miss. Just south of Islamorada you'll find another of the more popular Florida hiking trails. The entrance to beautiful Long Key State Park is just south of MM 68. At Long Key State Park you'll find two different trails you'll want to explore. The first and most popular hiking path is Golden Orb Trail. Situated near the campground, the 1.2 mile loop meanders through a mangrove swamp, out into the more arid coastal section, back into a tropical hammock, and then past a mangrove forest before returning close to the campground at the end of the parking lot. At a quarter mile in length, Layton Trail is the second, much shorter hike path. This trail is located on the Florida Bay side of the Key, so it is used less frequently. If you choose to take this hike trail, you'll have an opportunity to discover the raw, untouched beauty of the Florida Keys. The path will lead you past mangroves and tropical hammocks and you should be able to easily spot a good mix of wading and other birds. This hiking path loops around so when you reach the junction point, keep to your left and you'll come out onto Florida Bay. From here, the path leads you back into a hammock and then loops back to the head of this Florida hiking trail. Curry Hammock State Park is located at MM 56.2, Oceanside outside of Marathon Florida. The 1.5 trail at Curry Hammock State Park takes you on a winding walk from the Florida Keys Overseas Heritage Trail away from the ocean and towards Florida Bay. On your hiking trip you'll meander through a variety of vegetation that includes dense thickets of native thatch palms and mangroves forests. Crane Point museum has another of the more popular Florida hiking trails you'll want to explore. It's located at MM 50.5 outside of Marathon FL. The museum itself is worthwhile, but what sets Crane Point apart, is it's fantastic 1.5 hiking trail that is educational and fun. Two of the Florida Keys more distinguished landmarks are located just outside of Marathon Florida. The old and new Seven Mile Bridges are perhaps some of the most photographed features in the region. The area can also be somewhat congested as the new bridge is the only land connection between the Middle Keys and the Lower Keys. Since this is such a beautiful part of the Florida Keys, don't forget to bring your camera. Whether you're on the Seven Mile Bridge driving, hiking a stretch of the Old Bridge, or enjoying a visit to Pigeon Key, you'll have many amazing photo opportunities you won't want to miss out on. Just so you're aware of the situation, if you want to get out and stretch your legs, you can find parking for a fee at the north end of the bridge, Gulf side. 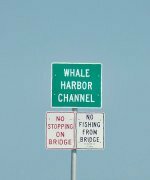 You'll also quickly see that even though the new bridge is considered to be part of the Florida Keys Overseas Heritage Trail, it's not meant for a casual stroll. 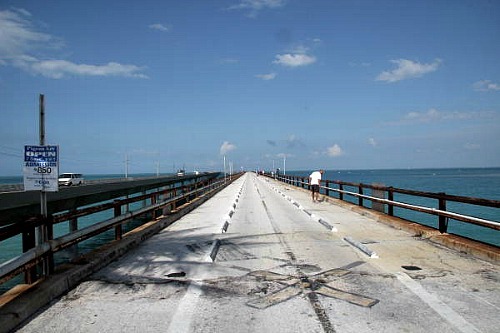 However you will want to stroll the non-operational, old Seven Mile Bridge also called the Pigeon Key Bridge. This is not a typical example of the more vegetated Florida hiking trails you usually explore, but this is a very worthwhile hike to plan on. Even though there are some rough spots on the bridge, it's still very passable, and it affords absolutely spectacular and invigorating views as you hike it's 2.2 mile length to the 5 acre island of Pigeon Key. Improvements are being made to the Old Seven Mile Bridge, which include a ramp that will run adjacent to the existing stairwell. This addition will give it easy handicap access allowing more visitors on a Florida Keys vacation access to this popular Marathon Key attraction. Once you reach Pigeon Key there are a number of Florida Keys activities you can enjoy. You can make a stop at the Pigeon Key Foundation's museum which is dedicated to Henry Flagler and the energetic building of his infamous railroad. There are also 8 historic buildings on the national Historic Register you can visit. Plus you can spend time on the island's small private beach, or go Florida Keys snorkeling in the surrounding warm water before hiking back to Marathon Key. The Lower Keys have some spectacular beaches, hiking trails and campgrounds to enjoy. In fact, these features are often heavily entwined, making your Florida Keys vacation even more memorable. You'll find one of the most popular destinations just south of the Seven Mile Bridge. This is the entrance to Bahia Honda State Park located at MM 37. 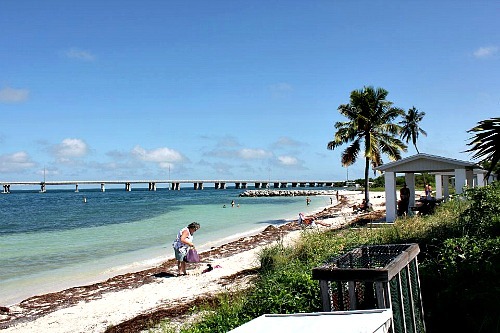 Bahia Honda is famous for it's 3 beautiful beaches, Sandspur, Loggerhead and Calusa. There are several Florida hiking trails at Bahia Honda, so to start your adventure on Big Pine Key, drive north on the Park Road past Sandspur's camping area and the beach parking area. Then continue for 1.3 miles and the road will end at another parking lot that has beach access. 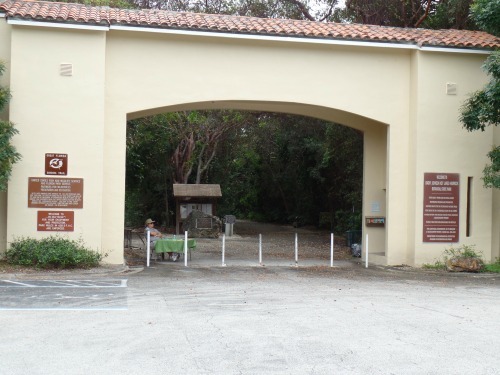 The entrance to the Silver Palm Nature Trail is at the north end of this parking lot. Once you arrive, you'll quickly discover that Bahia Honda is not only famous for it's beaches, but also for it's rare plant life and plentiful assortment of birds and wading birds. You'll want to keep your camera and binoculars handy since many of the more spectacular species thrive here. Expect to see great white heron, great blue heron, white ibis, snowy egret, roseate spoonbill, and anhinga as you stroll through the changing environment that surrounds you. South of Bahia Honda at MM 30 on Big Pine Key is the National Key Deer Refuge. Big Pine Key is famous for it's population of friendly and tiny Florida key deer. Here you'll have the opportunity to not only visit the deer, but also to explore the Watson Trail and the Refuge's poplar Blue Hole. You'll definitely want to make sure you have your binoculars and camera with you here. The Blue Hole is the only substantial fresh water area in the Florida Keys and it's also home to alligator. Being able to see 'up close' these reptiles is something you won't want to miss out on. You'll also be able to spot an assortment of other small native wildlife enjoying the benefits this rare fresh water area provides. The attached map and informational brochure shows where Blue Hole and the two hiking paths are located. At the Refuge you'll have several points of interest you can discover. The Blue Hole is an old quarry that has filled with water and it serves as an attraction point for man, birds, alligator and other Florida wildlife. 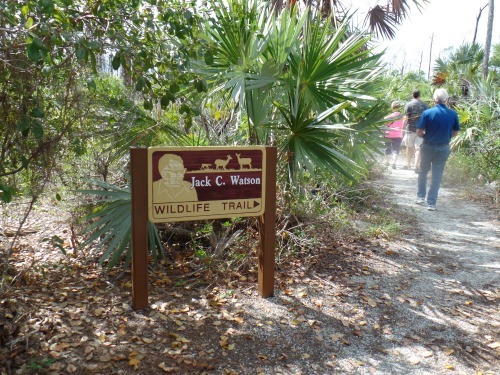 If you start at the Blue Hole, you'll then see the sign for the easy and meandering three-quarter mile Jack C. Watson Nature Trail. Once you've finished this leisurely walk, if you wish, there's a very short .1 mile hike you can take on the Frederick Mannillo Wheelchair Accessible Trail. From here, you can drive or hike south to beautiful Key West and the end of the Florida Keys Overseas Heritage Trail at MM 0. Not only does Key West, FL have numerous activities and attractions you can enjoy, there's beaches, camping and lots of places to go hiking. 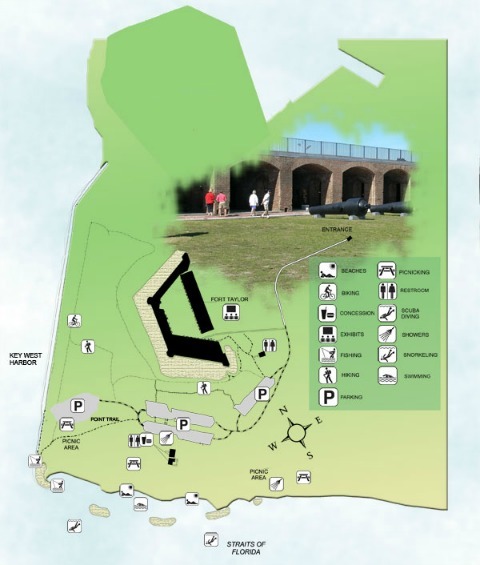 One of the places you'll want to spend some time exploring is Fort Zachary Taylor, located at the end of Southard Street on the Truman Annex. This is the furthest south of the Florida hiking trails in the United States and you'll find your experience to be considerably different here, than on the other Florida hiking trails. Nature plays a large part of any hike, however at Fort Zachary Taylor architecture, water, history and even rare birds become the principal focus. This magnificent old fort is the perfect photographic backdrop to the spectacular water views that unfold before you. This is also home to one of the area's best beaches, and snorkeling is a popular pastime. You can begin your hike on the beach at Sand Hog Trail which travels along the shore. Keeping to the left of the fork, you'll see a sign that says Foot Traffic Only. Continue on this path and you'll climb up the slope to the rocky seawall. Turn right and walk along the seawall and you'll get a totally different perspective of Fort Zachary Taylor as you look at it from it's ocean side. As you continue along the hike trail you'll reach the moat which affords an excellent view of the exterior walls of the old Fort. When you reach the parking lot, you can then turn towards the entrance and explore the interior on your own, or join one of the 2 daily guided tours. After you're done exploring the inside of the Fort, leave through the gate, and return to the edge of the moat. Here you'll see a nature trail sign indicating the Fort View Trail. Once you climb the berm, the trail takes you through a shady area and then leads you back onto the beach. While on this last leg of your hike, pay particular attention to the birds in the area. Many incidents of rare birds never seen elsewhere in the United States have been documented on this particular stretch of the trail. You'll find that while you're out hiking, you'll uncover many of your own special paths and trails. They're often tucked away, off a beaten path, or connected to another more popular trail. However, no matter which Florida hiking trail you choose to explore, you'll find that getting back in touch with nature, is much easier than you ever thought.